The dog days of summer, the grueling stretch of training camp, and preseason football is finally in the books. Tonight, football fans across the nation rejoice as the NFL season is finally upon us. The defending Super Bowl champion, the Philadelphia Eagles will kick off their pursuit to repeat against a dangerous Atlanta Falcons squad. In terms of this year’s playoff outlook, the National Football Conference (NFC) has a huge leg up on the American Football Conference (AFC) again this year. The NFC, highlighted by the best division in football in the NFC South, simply has far more depth than the AFC. Anything can happen in the NFL, but when breaking down the conferences, it looks like the NFC playoff push will be far more daunting than the AFC. Foxboro has seen better times, as direct signs of friction between longtime legendary coach and quarterback combination Bill Belichick and Tom Brady have come to the surface. The root of the conflict stems from highly regarded medicine practitioner Alex Guerrero’s involvement with the organization, and quarterback Brady most prominently. Belichick put his foot down after a while, as he proceeded to ban Guerrero from their facility during practice hours. The Patriots have successfully put these types of distractions to the side while taking the field on Sundays. However, this Patriots roster, particularly on the offense end, has gone through some changes that Brady and company will have to adjust to. Receiving targets Brandin Cooks and Danny Amendola, who combined for 1,741 receiving yards last season for the Patriots, both departed in free agency. New England also lost long time left tackle Nate Solder, the team’s former first round draft pick back in 2011, to the New York Giants. Solder will be replaced by Trenton Brown, who the Patriots acquired in a trade with San Francisco. On the defensive side, New England must move on from their old defensive coordinator Matt Patricia, who is now the head coach of the Detroit Lions. Brian Flores is the new man in charge of this defense. After adding former first round draft pick Danny Shelton and Adrian Clayborn to the defensive front, and getting top player on the defensive unit back from injury in Donta Hightower, Pats fans should be a little more optimistic on how the defense will perform. In the backend, New England is led by star cornerback Stephon Gillmore, but loses Super Bowl XLI hero Malcolm Butler to free agency, as he left on a sour note after Belichick shockingly chose to sit him in last year’s Super Bowl. The Jacksonville Jaguars and Pittsburgh Steelers are the greatest threats to the Patriots in the AFC, they’re the only teams standing in the way of New England three-peating as AFC champions. The Jags, affectionately dubbed “Sacksonville,” bring back a loaded defensive unit. At all three levels, this defense has all pro performers. The front is highlighted by Calais Campbell and Malik Jackson. Speedy play making by linebackers Telvin Smith and Myles Jack and shutdown corners in Jalen Ramsey and AJ Bouye round out the most dominant and intimidating defense in the league. On offense, the Jags are a little more limited, led by up and down quarterback Blake Bortles. He played well through Jacksonville’s first postseason run in a decade, but definitely has his shortcomings and can be a turnover machine. The Jags are extremely thin on receivers, but have a fantastic young workhorse in the backfield in Leonard Fournette, who’s entering his second NFL season. The team who fell short to the Jacksonville squad in the AFC divisional round last playoffs, the Pittsburgh Steelers, have an explosive offense that has to reckoned with. Veteran quarterback and two time Super Bowl champion Ben Roethlisberger, who turns 37 this March, strongly considered retirement after last season, but opted to extend his NFL career a little longer. On top of the uncertainty regarding the quarterback; all purpose running back, Le’Veon Bell, arguably the very best at his position, is butting heads with the front office regarding his upcoming contract. The Steelers have continued to franchise tag him, and as Bell’s frustration grows over no long term deal, it’s widely believed around the league he’ll leave after this season. For now, he’s healthy and in a Steeler uniform, which is enough assurance for Pittsburgh fans that he’ll produce. Both on the ground and through the air, Bell is a nightmare for opposing defenses. In addition, the Steelers have arguably the best receiver in all of football in Antonio Brown. His firepower combined with rising young threats at wideout Juju Smith-Schuster and rookie James Washington make Pittsburgh an offense capable of unleashing on anyone in the conference come playoff time. When dissecting this conference, the defending Super Bowl Champion Philadelphia Eagles have to be the first team brought up. Defensive coordinator Jim Schwartz’s already stellar defensive unit added multiple time pro bowlers Michael Bennett and Haloti Ngata to their roster. The offensive side is led by third year head coach Doug Pederson’s brilliant offensive play calling,a great offensive line, and multiple big time performers at quarterback. Backup quarterback and last year’s Super Bowl MVP Nick Foles will be the Eagles temporary starter, as last year’s regular season MVP candidate Carson Wentz is going through his last stages of recovery from last year’s ACL tear. Receiving threats Alshon Jeffery and Nelson Agholor, Tight End Zach Ertz, and Running backs Jay Ajayi and Corey Clement are all gearing up for another season in the city of brotherly love. Both Philadelphia quarterbacks will benefit from the mirid of weapons this offense has. The Eagles overcame Wentz’s departure and knocked off the New England Patriots in last year’s Super Bowl. 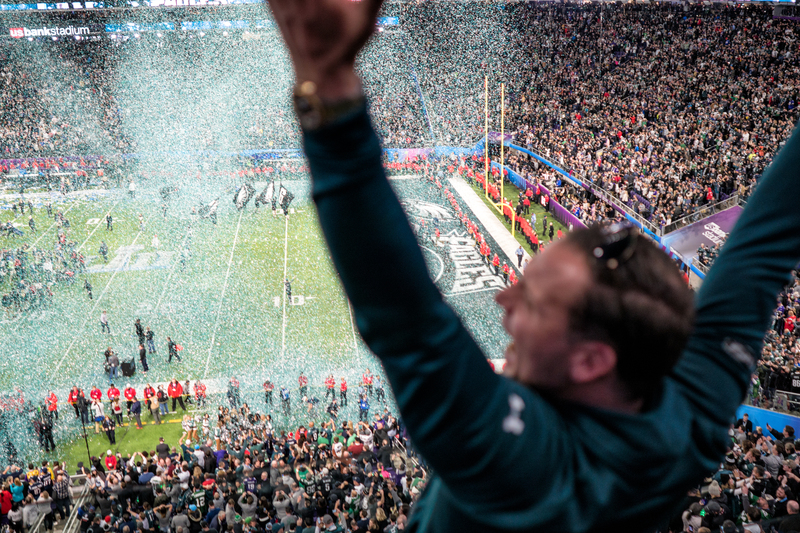 It was Philadelphia’s first Super Bowl in franchise history, giving them expectation for championship contention that hasn’t existed in Philadelphia for many years. Standing in their way is one of the more intriguing teams in the league this year the Los Angeles Rams. Wade Phillips is one of the more well-renowned defensive coordinators in the league. He’ll have plenty of brand new talent at his disposal, with defensive tackle Ndamukong Suh, and defensive backs Aqib Talib and Marcus Peters. On the offensive end, last year’s coach of the year Sean McVay enters his second season as Rams head coach. Last year he and second year quarterback Jared Goff burst onto the scene, with the help from an all purpose tailback Todd Gurley. Last year’s NFC West champion will have a definite chance to advance into the playoffs this year. It’ll be a challenge for McVay now that opposing teams have a full year of his offensive schematics on film. As aforementioned the NFC South is the best division in football. The biggest reason for this is great quarterback play, and these two contenders have two of the best in the business. For the New Orleans Saints, Super Bowl champion and future Hall of Famer Drew Brees runs the show. Saints running back Alvin Kamara is lightning in a bottle, his versatile play earned him NFC rookie of the year last season. Michael Thomas leads the wide receivers in New Orleans; expect Brees to utilize the big bodied, athletic receiver often this year. Elsewhere in the division, Atlanta has an offensive juggernaut of it’s own led by 2016 MVP and quarterback Matt Ryan. The Falcons also bring back receiver playmakers Julio Jones and Mohammed Sanu. At tailback, the tandem of Devonta Freeman and Tevin Coleman are back as well. All the primary pieces that helped Atlanta reach the last two postseasons are back, expect them to be in the playoff mix again this coming winter. The NFC playoff race should be as intriguing if not more than last year, as there are contenders littered all across the conference. The Eagles are certainly the odds on favorite, but anyone could rise above the rest this coming year in the NFC.